The wildest thing I did in my youth was…. Sharon promised us we wouldn’t have to read them; we were just practicing what we might implement as a September icebreaker. And as always, it was a packed audience with almost no seats to spare.What we didn’t know was that we were going to get partners because as we finished the assignment, Sharon and Beth randomly posted “backwards” other peoples’ writing on our backs. I’m liking this assignment for a first week, second day of school warm up, when all the class periods are a stable length. To make this “Please Do Now” work, you walk around and find your tag, and then discuss you answer with your new friend. Interestingly, at the beginning of this session, no one wanted to share a wildest action, but by the 15-minute mark, we were ready to tell. Sharon did a “3 – 2 – 1” to bring us back to listen time. You might think the first slide, “Amanda’s Amygdala,” would be a descent into highly technical language that just might lose us. Not with Sharon. The fun began with exploring the amygdala. A happy student’s amygdala is the filter for everything that goes into the brain, and it remembers the best and the worst. The amygdala is not ready to learn when a student enters your room. In order to be ready, students need to feel safe, wanted, and successful. A “Please Do Now” is a great way to condition your amygdala to learn. But whatever you do, how you begin your class is so critical to what your students will learn in your class. (I love that Sharon throws candy as a reward , and she never gives up if you can’t catch—what a fun session)! The cortex is responsible for thinking, so when the brain feels safe and successful, it’s ready to learn. In Reading Apprenticeship, the social dimension is so important because your classroom climate enables your brain to release chemicals that make you successful. The amygdala only wants 3 things: safe, wanted, successful. Routines and rituals: start your day the same way every day. Icebreakers: the biggest bang for your buck because it enables laughter. A safe social dimension (RA): desks in rows create difference and the amygdala does not like rows because it does not feel safe. A social lens (PLN): never use the word help because it makes a student feel stupid and shuts down the amygdala. Focus on the positive! Recognizing commonalities OVER differences; common ground is good; differences make us uncomfortable, so if you want to relax your amygdala, you need to feel welcome. While the cortex is the center of logic and reasoning and has grown with language, the amygdala has never grown. Neurologically, we are on the same page as an alligator, reptile, or horse: fight or flight. When the amygdala over-reacts, it acts impulsively; like the alligator, it’s not thinking. If there is a lot of fear out there, the cortex simply shuts down and then impulsive behavior sets in. Doesn’t that sound like what are oppositional students do. The Kauai Study by Werner & Smith, 1992, suggests that children born into at-risk families continue the pattern and are often affected by their situation. But some students in this category bounce back. The common thread to developing a bounce-back resilient adult is one person in their lives that cared about them. If you greet each student at the door with a student’s name, your students’ scores will go up 8% because students live in their amygdala. If you don’t care about the kids, they will not care about your class. The same is true in business. Emotion drives everything in learning. The “not-so-normal” students are students where their amygdala is over-worked and becomes disoriented and dysfunctional. They have damage to the reward pathway correlating to every emotional disorder that is known. These students do not know what to do in order to be rewarded. The dance between the amygdala and the cortex happens every day at school. If your students have a good time and can laugh in your classroom, they will learn. She who laughs lasts. 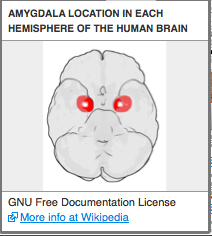 The amygdala is the gatekeeper, the pharmacist in your brain. So what can we do for our students especially if they do not know how to trust you? You need to show a dysfunctional amygdala that you care and it must be repetitive. They do not believe you. Need to reduce anxiety by creating connections. Amygdalas cannot be assessed; you cannot tell by reading the room if amygdalas are happy. Persistent practice: keep showing them the reward pathway. Make them feel successful; language needs nothing to them. Sleep issues co-occur with emotional disorders. I cannot begin to tell you how much I learned from this session that will make a difference for my students next year and their ability to achieve. I am certain it was because Sharon was fun, and I laughed along with the class, feeling safe, wanted, and successful. Throw in a large amount of happy, and you have the recipe for a perfect class. And it was!